I have a chia seed obsession. I have been known to put them in smoothies, and mixed with water and a little lemon juice, it’s they make for a great wake up drink. But using them in a dessert? Even better. 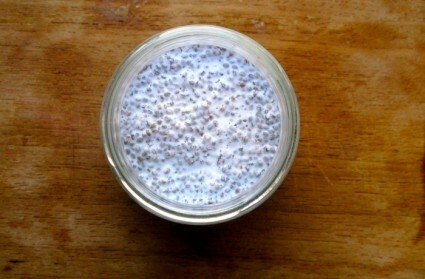 Chia seeds are sort of like magic; put them in any liquid and they turn into a gel-like substance. This is perfect if you’re trying to create a vegan pudding. 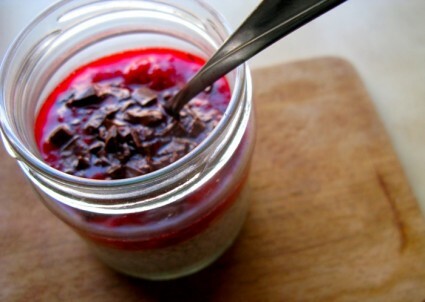 The consistency of this pudding, which is literally a “mix and stir” recipe, is a little like tapioca; the longer you let it sit the more it will firm up. You would never guess that this recipe takes a ridiculously short amount of time, is vegan and low on sugar. Make it once and it might just turn into your new evening (or afternoon) obsession. You can make it on its own, but I find it’s best topped with a berry compote, in this case, some summer raspberries that I had in the freezer. Mix chia seeds, coconut milk, almond flavoring and sugar in a bowl. Pour immediately into small serving containers and let sit for about 5 minutes. Cook down raspberries along with a dash of sugar in a saucepan on medium heat. Pour on top of pudding. Sprinkle with chopped dark chocolate. Serve immediately.